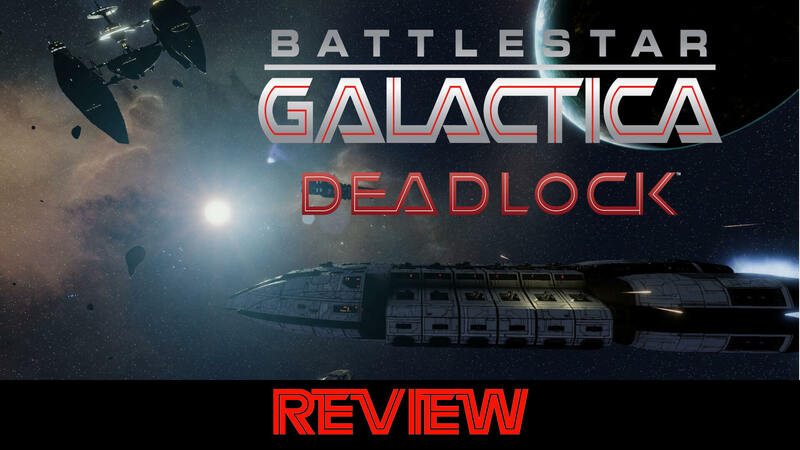 Battlestar Galactica: Deadlock was a pleasant and unexpected surprise, a turn-based strategy game that managed to capture the spirit of the Battlestar Galactica series much better than any other PC game has done so far. Developed by Black Lab Games and published by Slitherine, BSG Deadlock puts the player in the position of a colonial fleet commander at the very beginnings of the Cylon uprising. You need to traverse twelve human colonies, complete missions and fight Cylon threats in order to obtain resources such as Tylium and recruitment points. Tylium is used to buy new ships and unlock blueprints for more advanced vessels, while RP’s can be used to recruit officers that, once they become more experienced, provide bonuses to the fleets they are stationed at. These bonuses can be the improved strength of the ships or increased capacity of the fleet. Cylons do not rest for a second. Their fleets will be popping up all over the place and you will need to intercept and destroy them. Fail to do so and colonies they harass will start losing faith in you, becoming unstable, which will cause a decreased production of Tylium and less resources at your disposal. Essentially, if you do not protect colonies, you will lose them as well as the game you are playing. Your first fleet consists from a flying shipyard that excels in two thing; producing new ships for your fleet and acting as a formidable target for Cylons, without packing any significant punch (except for two squadrons of Vipers). In order to survive each engagement, the shipyard must be kept alive. Both the campaign and the battles are turn-based. You decide what you want to do on the campaign map, where to send your fleet or what ships to build, and hit turn. When you engage Cylons, you will deploy your fleet and try to keep your shipyard alive. The turn-based occurs in 3D “pizza box space”, which means that all the ships can move in all directions, but elevation movement (going up and down) is somewhat limited. If you ever played Starfleet Command, you will recall the concept. Elevation mostly serves to avoid collision of the ships, which is actually a real thing in this game. If you do not pay attention to your ships, they might easily bump into each other, or you might get rammed by a Cylon vessel. After having lost two ships in otherwise perfect engagement through a collision caused by my lack of attention, I quickly learned to respect and monitor every movement of the elements in my fleet. You can issue move and attack orders to your ships, but in order to win you must know where your ships need to be in three, five or even ten turns! Most ships have additional special weapons, be it a squadron of vipers, guided missiles or torpedoes. The munition is limited, and while you can fire the normal cannons on all your vipers and ships for as long as you are fighting, the missiles and torpedoes can be depleted. Also, it takes several turns until they are recharged and can be used again, so think carefully when and how to employ them. All ships have their strengths and weaknesses, and you need to know them in order to win. All ships have armor, fore and aft, left and right, below and above (remember the elevation?). When being hit, the armor gets depleted, and afterwards the ship starts taking hull damage. When hull reaches zero, the ship explodes. Now, proper positioning means the difference between life and death. Some ships have weaker armor on the front and aft sections, so it is recommendable to always try and hit them with your canons and missiles in exactly those spots. If you happen to charge with such a ship into the enemy and lose front armor, you need to pull hard to either starboard or port, thus exposing your armor heavy sides of the ship, so you don’t receive hull damage. Ships also have arcs of fire; some are straight shooters, other fire broadsides. This, too, needs to be taken in consideration before engaging into the battle. The closer the ship is to you, the better target it will make, but that goes both ways. Finally it is worth noting that ships also have subsystems that can be damaged or even hacked, which then need to be repaired before taken into action again. Cylon corvettes have an immensely obnoxious hacking attack, which can shut down your vital systems, forcing the ship out of the battle. Flying around in undamaged ship which is unable to attack because the weapon fire controls have been disabled is extremely frustrating, so you need to make sure not to ignore the hacking attacks. Finally, it is worth noting that you carry over your ships from previous battles with you. This means that winning a mission and suffering serious losses while doing so will result in your diminished strength when it comes to the next engagement, which you probably will not survive. That is the reason why you constantly need to build new, better ships as well as improve their fittings, get better ammunition and more advanced fighters. The game is not telling you how hard the next mission will be; you will find that out in the moment when you face the Cylons who have employed the next class of cruisers for a particular battle while you are still flying around in corvettes and frigates. Of course, a well balanced and versatile fleet is better than a mass of strongest ships, but you also need to be packing a good punch. Make sure you don’t pick up the next mission before your fleet has been maxed out and you have some confidence that things will end up well. I love Battlestar Galactica. It puts a very high value on tactical engagements, where positioning has an extremely important role. Split your fleet and you will suffer when sudden reinforcements drop in. Move too far away from your shipyard and Cylon reinforcements will take it out before you can get back into range to defend it. Ignore your ships and they will collide and expire in a great ball of fire. There is a simple, yet very attractive depth to this kind of gameplay. It is more than sufficient to bring you throughout the campaign. Atmosphere is unique, and hits the series vibe better than anything I have experienced so far. Camera movements, the music, sound effects of firing guns, all of that does a great job to submerge you into Battlestar Galactica universe. There is not much to berate the game about, except perhaps the obnoxious character narrations. They are probably the only aspect that could have been shortened or even entirely dropped out of the game and nobody would complain. If you are a fan of good space strategies with a turn-based system, you should not miss out on BSG Deadlock, especially if you are a fan of the series. It will provide a good, solid game fun and won’t leave you disappointed. BGS Deadlock is a very solid, turn-based space strategy game that will bring you a lot of hours of fun and entertainment. It is probably the best presentation of the Battlestar Galactica universe in the PC gaming so far.